I’ve been in B2B for about 15 years now, dealing with senior executives in a wide variety of companies. For the most part, the decision-makers at these firms have usually fallen into the 45–60 year-old age category—people in senior roles, at the peaks of their careers. But in the last two years, I’ve started to notice a real shift. Those decision-making roles are increasingly being filled by millennials. While I’ve certainly seen this younger cohort in the workplace, they haven’t been the ones making the decisions—until now. Millennials are now at an age and stage of their careers where they are making key buying decisions. And what I’ve been seeing anecdotally is supported by data. Google recently put out a report called The “Changing Face of B2B Marketing.” Mirroring data collected in 2012, their research (based on a survey of 3,000 B2B marketers) showed that there has been a shift to a younger, more digitally savvy buyer—and that things are changing faster than you think. 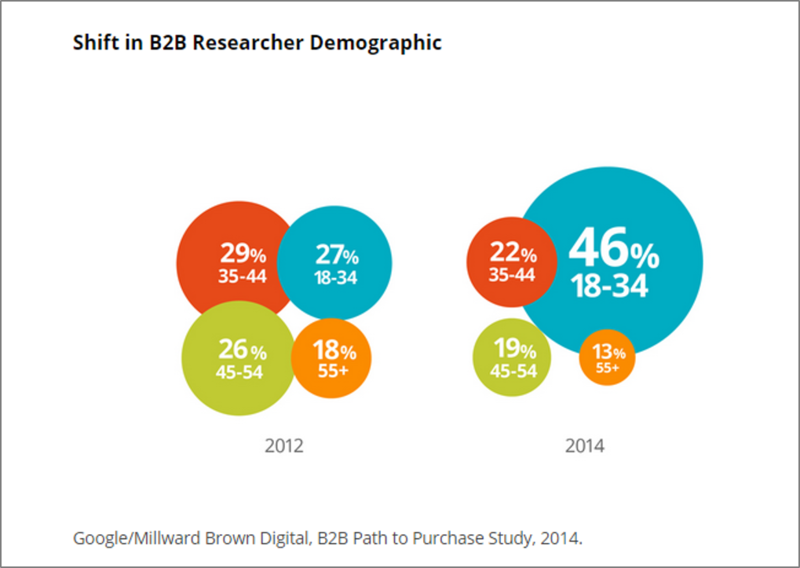 The report looked at the age range of decision makers conducting research into B2B purchases. In 2012, 27% were 18–34 years old, and 26% were 45–54. But just two years later, those numbers had changed dramatically: 46% of B2B researchers were 18–34 years old, while the 45–54 category was down to 19%. That means almost half of all researchers/buyers are millennials, which changes the marketing playing field dramatically. You simply can’t talk to millennials the same way you could to the previous generation of buyers. They expect to be communicated with digitally, using video, rich online content and mobile-friendly platforms. If you’re not doing that, you’re not even on their radar. B2B marketers need to focus on digital and social media because that’s how the new cohort of decision makers is finding and connecting with vendors. As I write in my new book, The Radical Sales Shift, B2B companies need to invest more in marketing than in the past, because the new breed of buyer is far more likely to meet your business online than at a tradeshow. You also need to pay close attention to mobile content. There’s been a 91% growth in buyers using their phones to do research as part of the purchasing process, and Google recently released a new algorithm that focuses on responsive, mobile-friendly site, and penalizes those that don’t function the same across all devices. If you’re the leader of B2B company or a B2B marketer, now is the time to ensure your business is connecting with the next generation of decision makers. This post first appeared on PROFITGuide.com.